Considering he never could shoot and can't run anymore, this is the only move CP3 has to worry about tonight! The only job that might be easier than Chris Paul's is being the Director of Bubble Placement for this photo shoot! While the German Diggler and his boys gave me a victory on the ATS docket last night, the gut-wrenching two point loss in Denver didn’t do much for their psyche and saw their top two veteran scorers (Dirk & Terry) log nearly 80 minutes. With Josh “getting-high, driving-fast, & hatin-America” Howard out last night, the Mavs offense relied solely on isolation plays for Dirk and transition jumpers for Terry. Unfortunately, with Howard’s replacements shooting 2-14 (Antoine Wright, Jose Juan Barea, & Devean George) and Granpda Kidd injuring his elbow late in the contest after shooting 1-9 from the field, I’m guessing the plane ride from Mile High was nothing like the vibe on Snoop’s Soul Plane. Just like our tan friend in this white bikini, the Hornets off an embarrassing loss is a wonderful ATS selection! On the flipside, the (22-12) Hornets had Byron Scott stewing to the media yesterday after the team's shameful home-loss to the Knicks Monday. At times, New Orleans has looked like Jassie James in “Old Geezers, Young Teasers" (flawless compared to her cast mates), but similarly to her lazy performance in “Super Ninja Bikini Babes” a few months later, the Hornets have a tendency to play down to the competition. But tonight, especially after the abysmal performances from Peja & David West against NY (combined 9-32 FGs) and the consistent inability of Joumana’s whipping-boy to hang with CP3, I expect the Hornets to work-ova a tired and undermanned Mavericks squad. 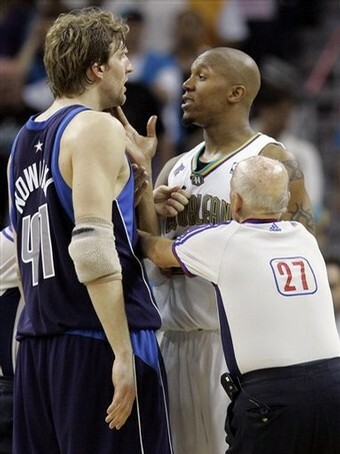 While Dirk & David usually have some fierce battles, the Diggler off 42 minutes last night bodes well for Mr. West! The Dukes cover-up at home almost as well as Josie Maran covers-up at the beach...and that makes me smile! Considering most casual fans don’t even know Duquesne resides in the A-10, let alone invest on them because they don’t want to embarrass themselves on a bookie’s voicemail or with the Sportsbook because they can’t pronounce the university, oddsmakers always seem to give the kids from Pittsburgh a favorable line. And once again tonight, the Gambling Gods are proving they have a soft-spot for degenerates risking phonetic embarrassment. Mr. Jackson might be the best PG you've never heard of! TO KEEP READING this breakdown and more ATS picks, TOUCH ME HERE or lick her tattoo...I promise it'll work! Just like how little Lima looks in lingerie & heels, nobody in the A-10 looks better than Aaron Jackson at the point! The (11-4) Dukes are led by one of the most underrated and efficient point guards in the country, 6-4 Sr. Aaron Jackson (18 ppg, 6 rpg, 6 apg, 59 fg%, 42-3pt%). Combined with his unselfishness, Jackson’s ability to draw most of the attention has open things-up for his talented teammates. 6-7 So. Damian Saunders (14 ppg, 8 rpg, 2 bpg, 60 fg%) is a nightmare around the rim and continues to improve his soft-touch from mid-range; 6-5 So. Bill Clark has blossomed into one of the most versatile wings in the conference (12 ppg, 5 rpg, 3 apg, 47 fg%, 39-3pt%); and a bevy of sharp-shooting guards spread the floor to maximize Jackson’s creative abilities off the bounce. While Duquesne's losses compare to getting denied by Brooke Burke, GW's losses compare to getting denied by Tara Reid! As for the (6-7) Colonials, they’ve only won twice on the road this year and are in the midst of 5-game losing streak. And while Duquesne’s only losses have come against the powerhouses (Duke, W. Virginia, Pitt, & Old Dominion), since X-Mas George Washington has already lost to Longwood, Richmond, Hawaii, Coppin State, and Vermont. While they have two decent forwards that should keep Damian Saunders from dominating the paint tonight, their young backcourt has been abysmal this season and should struggle even more against the disciplined star-power from the Dukes backcourt. Trust me Homeboys, Duquesne at home versus GW equals 20-point blowout! The only thing better than a Reality Star tease on the beach is a real group of stars teased on the hardwood! The Rebels should be sitting pretty for an easy teaser cover! This page contains a single article from January 14, 2009 11:53 AM. The previous days article was ATS Hardwood Dominance & Lovely Ladies. The next days article was Thursday Night Hardwood Handicapping.